Meeting this Thursday April 17! Hi everyone! We’re going to have a fun, action-packed meeting for y’all on Thursday night. Come on down at 7PM to Rock Paper Scissors and join us for some quilty goodness. 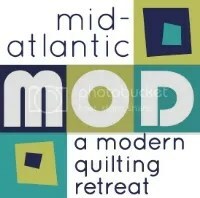 A roundup of some recent events, including March Madness and Sewdown, and a preview of Quiltcon. Prizes for our guild quilt block challenge for winners chosen by celebrity judges Mark Lipinski, Alison Glass and Elizabeth Hartman. * Mark will be joining us to present to the winners and say a few words. Discussion about nominations for our upcoming June elections. * On our post about the guild quilt challenge blocks we assigned each block a number. Please leave a comment with your name and your block’s number on this post so that we can identify the winners and runners-up. ** You voted and we listened, but sadly we couldn’t comply with the vote to cut 11×18 fat eighths. Because we were sent less fabric than we needed for everyone to get some, we had to cut 9×22 pieces. I know it’s not ideal, but we wanted to be sure that everyone who wanted to play got to. Many guilds got too little fabric and because the people at Michael Miller were so generous to give us all this fabric for free, the MQG has told us we won’t be getting any more. We’ll talk about this more at the meeting. If there’s anything you’d like to discuss or plug, please send an email to njmqginfo at gmail.com. Bring your chair and your nametag, and we’ll see you Thursday! ← The Michael Miller Challenge fabric is here! Good morning Gemma! Meeting information is on our website at njmqg.com/meetings. The next one is May 15. My blocks are #15 and #25.